A pharmacy employee at a Nashville area Walgreens was taken into custody for allegedly stealing 500 Percocets. 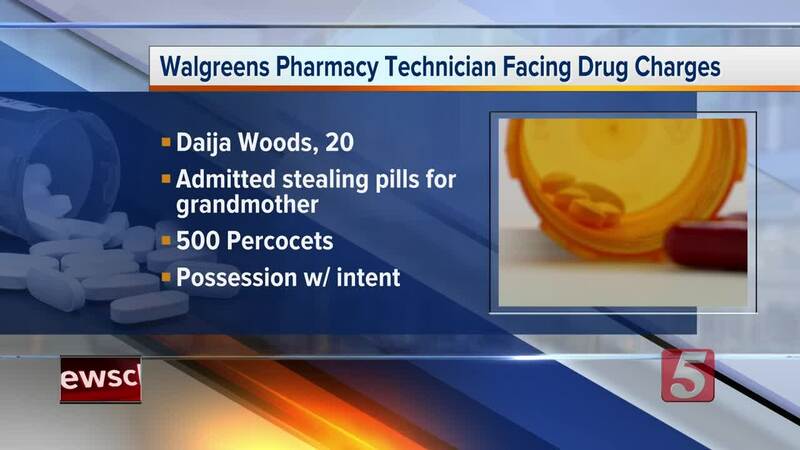 NASHVILLE, Tenn. (WTVF) — A pharmacy employee at a Nashville area Walgreens was taken into custody for allegedly stealing 500 Percocets. According to an affidavit from Metro Nashville police, 20-year-old Daija Woods is facing a felony drug charge and a theft charge. Woods said she stole the pills for her grandmother, who’s sick and couldn't get the oxycodone through insurance. An Asset Protection Manager at Walgreens contacted Metro Police on Thursday. He said Woods had taken home 500 Percocets after her shifts at the store, which is located on Gallatin Pike in Madison. She was allegedly taking them in quantities of about 20 to give to her brother to give to their sick grandmother. Woods doesn't have a criminal record. She’s due in court next month.